For those who are interested in the development in biogas technology, a new advantage of anaerobic digestion for Land Carbon Storage is beginning to emerge from recent work on the policy changes needed by the UK government to reduce global warming, by the UK’s Committee on Climate Change (CCC). To some this might seem to be a highly technical subject of little interest, but read-on to find out why that would be a mistake. In the future the ability of the AD process to provide suitable biomass (i.e. as digestate) to raise the carbon content held within our soils is likely to become a major factor driving the development of AD and biogas technology globally. The CCC is the statutory body established under the UK’s Climate Change Act 2008. It’s task is to advise the UK Government (and Devolved Administrations) on emissions targets. It must report to Parliament on progress made in reducing greenhouse gas emissions and preparing for climate change. Essentially, it must advise on how the UK will meet its obligations since September 2018 when it signed the “Paris Agreement”. Our article continues below the video which follows. The video summarizes the main points in this article. After watching the video below, we suggest that you return to this page and continue to read the article. As part of this work the CCC produced two reports in November 2018 on land use and biomass, and these consider the very important role of the land (soil) to hold and store carbon. If the carbon held in the soil was to be increased in future years, it would mean that less carbon would be freed into the atmosphere. While this was happening it would be reversing greenhouse gas (principally carbon dioxide) quantity in the atmosphere. This would directly reduce climate change. A recent report by the Committee on Climate Change assesses the role of land use change in meeting climate change mitigation and adaptation objectives. The Government needs to address climate change, which threatens the land’s ability to provide critical services including clean water, healthy soils and timber, and ensure sufficient food production for an increasing population and space for new homes. Overall, the report finds that fundamental reform is required to ensure land becomes a more effective carbon store, whilst early action is needed to maximise the benefits from changing how land is used. Our opinion on what this means for the Anaerobic Digestion and Biogas Industry as land becomes a more effective carbon store, is a huge demand for biomass which can be added to land. The advantage of anaerobic digestion is that fibrous digestate has a low pollution potential. it is also “hard to digest/ slow to decompose”, and will remain in the soil for as long as possible before decomposition (re-emission to the atmosphere). An additional advantage of anaerobic digestion will be in its ability to provide carbon-to-land from a huge range of waste biomass sources which would not be suitable for this use without prior digestion to remove highly (watercourse and groundwater) polluting initial releases. These releases would otherwise occur from aerobic decomposition on the land, and in many cases the sanitation provided by pasteurization during the AD process will also be needed. Biomass char has also been identified as an ideal long-lasting soil-carbon product, and this can be manufactured cheaply from the fibrous digestate from biogas plants. At probably generally lower prices than for other bio-char products, especially if on-site energy is used in the pyrolysis process which produces it. “ADBA welcomes these two important reports from the CCC. “With regard to land use, the CCC is absolutely right about the need for fundamental reform to ensure land becomes a more effective carbon store. Anaerobic digestion (AD) plants produce nutrient-rich, natural fertiliser that helps to restore organic matter and NPK and lock carbon into soils, and the AD industry would like to see greater recognition from government of how this can help to improve the health of the UK’s soils. “Use of AD on farms also supports the CCC’s call for low-carbon farming practices through allowing farmers to recycle their manures and slurry into renewable energy and natural fertiliser. “We also welcome the CCC’s recognition of the importance of organic waste and energy crops (where grown sustainably) in meeting the UK’s long-term emissions targets. The CCC is absolutely right that the government should continue to support AD deployment to ensure that the industry can make the maximum possible contribution towards tackling climate change. CCC Chief Executive Chris Stark recently wrote in ADBA’s quarterly magazine that AD is a “genuinely ‘low-regrets’ option” and that “the wealth of evidence supports the case for [AD] deployment”. The findings of the CCC’s reports will be discussed in detail at the ADBA National Conference 2018 on 11th December 2018. If you prefer this can be seen on the YouTube website here. ADBA is the trade association for the anaerobic digestion (AD) industry in the UK and companies and organisations working on novel technologies and processes that compliment the anaerobic digestion process and products. With our members they promote the economic and environmental benefits of AD in the UK (Advantage of Anaerobic Digestion). 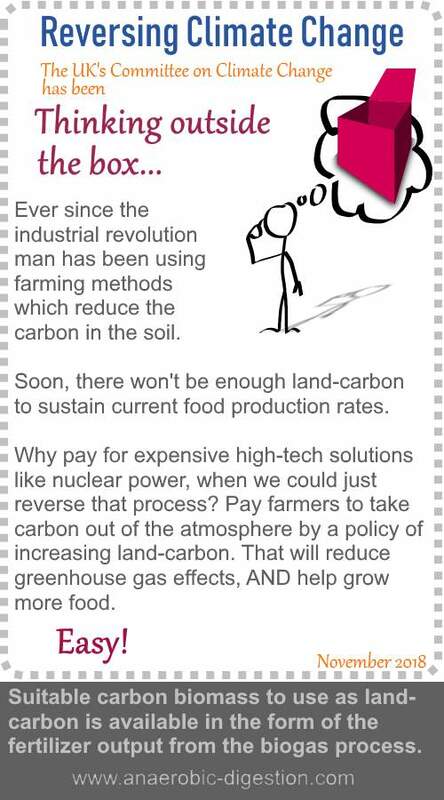 Seems logical, but how can carbon storage be this easy? If I get this, why isn’t the whole world doing this?